West Seti project is one of the best projects of the genre, because it not only generates 3,636 GWh of peak-in energy (750 MW of power) – good quality power – but such power at low cost and also results in flood control in downstream areas, mainly India and dry season augmented flow of 90 m3/s. Moreover, export of hydropower to India from this project results in carbon offset benefit which is tradable and is a good source of revenue. Although, there is no information available on the quantum of flood control benefit, but 90 m3/s of augmented flow during the dry season is worth $ 83 million (equivalent to Rs 5.81 billion) annually based on the principle set forth by the agreement between Lesotho and South Africa; for supplying 18 m3/s of water (both for the purpose of irrigation and drinking water) to South Africa, who pays Lesotho a lump sum of $25 million (in 1991 prices) each year from Lesotho Highlands Water Project. For purposes of both irrigation and drinking water we could also develop a mechanism to share such benefit on the precedent set by the Columbia Treaty. Under Article V: “Entitlement to Downstream Power Benefits” of this treaty “Canada is entitled to one half the downstream power benefits”. The downstream power benefit has been defined by Article VII as “the difference in the hydroelectric power capable of being generated in the United States of America with and without the use of Canadian storage.” Drawing a parallel with the West Seti project, as the installed capacity of this project without a reservoir is just 100 MW, the power benefit of the construction of the reservoir is 650 MW and Nepal, under the principle established by this Treaty, is entitled to 325 MW. Unfortunately, the extant paper work between Nepal and the proponents of West Seti project has deprived Nepal of these innate rights. Nepal deserves to be recompensed for the downstream augmented benefit based on the lines of agreement between Lesotho and South Africa or on the basis of the precedent set by the Columbia Treaty. Failing to emulate the principles set in one of these treaties, there is no point in implementing this project. Emission of carbon dioxide from the use of fossil fuel has resulted in global warming in a larger scale which in turn has induced climate change. In order to mitigate this problem, the Clean Development Mechanism (CDM) has been put in place which is a mechanism within the Kyoto Protocol that allows industrialized Annex I countries to implement projects that reduce emissions in non-Annex I countries (developing countries) and get credits for meeting their commitments to reduce emissions. Generation of hydropower does result in environmental additionality due to carbon offset by it, in not emitting green house gases (GHG) in environment. As envisaged by Kyoto Protocol, trading in such carbon offset, also known as carbon credit, is already taking place. However, as Nepal is bereft of any fossil fuel exploration activity, and its use of such polluting source of energy as a source of energy is negligible and, therefore, Nepal’s baseline is deemed to be the hydropower which doesn’t pollute. Because, under Kyoto Protocol, a country like Nepal with hydropower as its baseline, environmental additionality is not deemed to be accrued by generating additional hydropower for domestic use, except in the case of hydropower plant of up to 15 MW. Therefore, most of the projects are not considered to be generating environmental additionality. Whereas, as West Seti project exports “clean” power to a country whose baseline is not hydropower, the transaction does succeed in offsetting carbon dioxide. In view of this, export of hydropower from Nepal to India is a good candidate for trading in such carbon credits for which West Seti project is in a comparatively better position to do so. Of the annual generation of 3,636 GWh, this project is obliged to provide 10% to Nepal free of cost and it will be exporting 3,272 GWh to India each year. As one liter of diesel generates, generally, 4 kWh of electricity, export of power from West Seti will displace 818,100,000 liters of diesel each year in India for generation of power. As the emission factor for carbon dioxide (CO2) for diesel is 2.68 kg per liter, consumption of 3272 GWh of electricity imported from Nepal will offset 2,192,508 tons of CO2 in a year in India. Similarly, as diesel also emits Nitrous Oxide (N2O) and Methane (CH4) besides CO2 and the emission factor as given in the IPCC for N2O is 0.032 kg CO2 equivalent per liter of diesel with global warming potential (GWP) of 300 and 0.004 kg CO2 equivalent per liter of diesel for CH4 emissions with GWP of 21. Therefore, the export of 3,272 GWh to India each year will also offset N2O by 26,179 tons of CO2 equivalent and CH4 by 3,272 tons of CO2 equivalent. In total the export of electricity from this project will offset by 2,221,960 tons of CO2 equivalent in a year. Such carbon offset has a market under Kyoto Protocol. Although the price of carbon offset ranges between $ 5-15 per ton of CO2 equivalent, for the sake of simplicity, using a median price of $ 10 per ton of CO2 equivalent yields a revenue stream of $ 22.2 million (equivalent to Rs 1.55 billion) per annum. In view of the numerous benefits, as described above, that construction of this project will educe this is definitely one of the best projects of the genre. However, benefits don’t come alone and there are always numerous and matching costs. But there are costs (beyond the initial investment) involved in building this project in terms of environmental degradation, submergence of forest, cultivable land, etc. that Nepal will have to bear. The project’s reservoir inundates/submerges 25.1 km of the Seti River and a total of 28.0 km of five main tributaries (Chama Gad, Dhung Gad, Saili Gad, Nawaghar Gad, and Kalanga Gad) which displaces 18,289 people. According to the same report “The permanent project features will require the acquisition” of 659 ha cultivated land, 806 ha forest, 169 ha shrubs, 246 ha grassland, 9 ha abandoned land, 5 ha settlement, 409 ha river feat. and 23 ha rock/cliffs/screes totaling 2,326 ha of land. Similarly, 678 ha will be “utilized for the transmission line ROW.” In total the project will use 3004 ha land permanently. The acquisition of land as such is covered by the EIA report. The project proponent has plans on the anvil to rehabilitate the displaced people by providing land in lieu of cultivated land. However, the land occupied/cultivated by the displaced populace is just 659 ha of cultivated land, comprising 22% of total land to be acquired. In order to rehabilitate the displaced people, the project will be providing land in lieu for the cultivated land in Nepal. In this manner the project will be using Nepal’s additional land for the purposes of rehabilitation. However, the project has no plans to provide land in lieu of remaining 2345 ha land (3004 ha minus 659 ha) that the project is to use. An important question that arises is why Nepal should sacrifice 2345 ha land to provide good quality low cost power to India, which will also enjoy the benefit of flood control in rainy season and augmented flow in the dry season. But, according to Dr Anand Bahadur Thapa, additional 1,630 ha land gets submerged permanently and 645 ha partially in Banke district, in Holiya, Bethani, Gangapur, Matehiya and Phattepur VDCs, resulting in displacement of 15,174 people, due to Laxmanpur “barrage” in India coupled with the augmented flow. This is not covered by the EIA report and, therefore, no rehabilitation plan has been put in place. This raises the question as to why an institution like ADB is associating itself with such a project. One is forced to wonder if it is happening with its concurrence or complicity. Clause 7.2(d) of the Project Agreement and Rule 20 of Electricity Regulations, 2050 puts restriction on consumptive use of water in the upstream area in order to ensure adequate water for the project to generate electricity. This restriction adversely impacts following VDCs which will not be allowed to use water in the upstream area for consumptive uses like irrigation etc: Rayal, Dangaji, Parakatne, Bhairabnath, Chaughari, Kotbhairab, Malumela, Matela, Subeda, Luyata, Hemantabada, Chainpur, Sunkuda, Banjh, Khiratadi, Dahabagar, Pipalkot and Kapalseri in Bajhang District, Belapur in Dadeldhura District, Shivalinga, Dhungad, Sigas and Thalakada in Baitadi District and Lamikhal, Mahadevsthan, Dahalkakikasthan, Girichauka & Chhapali in Doti District. The project people are trying to undermine the importance of the issue by saying that there will not be any restriction on drawing of water by the people in these villages for the purposes of drinking. The important issue here is the water for irrigation purposes. Due to the restriction imposed by Clause 7.2(d) of the Project Agreement and Rule 20 of Electricity Regulations, 2050 no new irrigation work will be allowed to be undertaken in these villages. Their attempt to obfuscate the mater will not help the project. Rather, this is the best way to lose their own credibility in the eyes of the people adversely impacted by the project in particular and others in general. Water also will become unavailable for use by locals in the de-watered area which adversely impacts Bayarpada, Banlek, Jijaudamandu, Latamandu and Pachanali VDCs in Doti District and Belapur in Dadeldhura District. The environmental flow of 10% that the project is required to leave in the dewatered area will not be adequate for the residents of the villages on the banks of the dewatered river to undertake irrigation work. From the above table it is clear that all of the costs have to be borne by Nepal while benefits go to India making one wonder why Nepal is allowing implementation of such a project. The question that occurs to patriotic/nationalist Nepali people is why should Nepal sacrifice 4,634 ha of land permanently and 645 ha partially in order to provide (a) good quality power at low cost, (b) flood control and augmented dry season flow free of cost to India and (c) also carbon offset benefit to India. As a country there is sense in inundating its land mass in one area in order to benefit other area in terms of flood control and augmented flow which will make multiple cropping possible, including off season planting of high value agricultural produces. But that is not the case here. As the issue of good quality power at low cost to India is dealt with below, the issue of flood control and augmented flow will be briefly discussed here. It does not require the knowledge of rocket science to understand that building a reservoir – to store the rainy season water and use it during the dry season – does indeed result in flood control during the wet (rainy) season and augmented flow during the dry season. In view of the fact that Seti is a relatively small river compared to Karnali (Ghagra in India) River, although the flood control benefit by building the reservoir will definitely accrue, but may not be highly significant. However, there is no doubt whatsoever that the retaining water of the rainy season in the reservoir built for electricity generation will augment the flow in the Seti River in the dry season and, consequently, in Karnali in Nepal and Ghagra in India substantially. As 75% of the dry season flow of Ganga River is contributed by rivers in Nepal, Karnali being one of the major ones, the incremental flow will be significant. Only issue that needs to be settled is the quantum of such augment flow, objectively. Dr Anand B Thapa, an eminent scholar, has opined that it will amount to 90 m3/s while others feel that this is slightly overestimated quantum. The issue that needs to be debated is not how much will be augmented – which can be scientifically assessed – but why should Nepal have its land, forest, infrastructure, etc. submerged and have its populace displaced in order to provide additional fresh water to India free of cost. There are people in Nepal who are happy to surrender everything to India, even Nepal’s sovereignty, while paying lip service to the spirit of working to the best interest of Nepal and its people. But the majority, thankfully, will never agree to the sell out of Nepal’s interest in any form. Unfortunately, the majority is neither well informed nor is in a position to stop the hydrocracy (politicos, bureaucracy and intellectuals involved in water resource sector development) from signing away Nepal’s interest, in treaty after treaty; manifesting in the treaties for Nepal’s major rivers like Koshi, Gandaki and Mahakali. That was a phase where such bi-national treaties were signed and a lot of controversy raised. These people, with the inclusion of Article 126 in the Constitution of 1990 (Article 156 in Interim Consitution), requiring ratification of such treaties by simple majority in the case of treaties of ordinary nature and by two-thirds in the case of treaties that affect the nation extensively, seriously or in the long term, have changed track. They are now putting forth fronting companies which secure Indian interest in Nepal’s water by getting licenses for hydropower. Thus in the name of hydropower development, Nepal’s land, forest, infrastructure, etc. is submerged and have its populace displaced to provide flood control benefit and augmented flow in the dry season free of cost to India. India's union water resources minister Mr. Saif Uddin Soz had been frank and honest in admitting, with Navin Singh Khadka, BBC Nepali Service, 12 September 2008, that “Our main interest is flood control and irrigation. Those are our first and second priority. If we get hydroelectricity as by product, that will be a bonus for us.” This is the first time that an Indian official (of highest level) has been candid in admitting as much. Surprisingly, however, this has yet to be understood by Nepal’s hydrocracy. Or it may be a case of them pretending not to understand it, in order ensure that Indian interest is served by implementing projects in the name of hydropower that afford flood control benefit and augmented flow at no cost to India. What galls ordinary Nepali citizenry is the fact that these people parrot the statement that they are working to serve the best interest of Nepal and its people while betraying the nation and the population no end. This breed of “patriotic” people even sarcastically dismiss the issue by saying that the water from the tailrace of the West Seti project will not just jump into Indian territory and go on to add that between the tailrace and Indian territory the augmented flow traverses over 100 km of Nepali territory. What they don’t admit is the fact that if West Seti project isn’t built as a multipurpose project, with an objective to irrigate Nepali land by using the augmented flow, the augmented flow will fall in Indian lap as a low hanging, ripe fruit, and after using such water during a couple of seasons, they will have a strong case to invoke the principle of “existing prior consumptive use.” It is well known by now that using this very principle the water from Mahakali River – deemed to be a border river and each country being entitled to half water – India got away with 96.5% water and leaving just 3.5% for Nepal. Interestingly, this breed of people even come to the defense of the treaty – and by extension India – by arguing that it doesn’t make sense for Nepali people to clamor for 50% share of the water when Nepal isn’t even able to use 3.5% (such is their patriotism!). They further demonstrate their “patriotism” by adding that even the water in the rivers flowing in Nepali territory – forget the border rivers – does not exclusively belong to Nepal. They profess to subscribe to the principle of “international water course” and assert that India too has right to the water in such rivers in Nepal. If that is the case then Nepal too has right to the water in Nepali rivers while they are flowing in China. But they never dare to raise voice as such, except to assert Indian right over the water in the rivers in Nepal. This is a shockingly subservient view, as Indian government has already acceded that “HMG shall have every right to withdraw for irrigation and for any other purpose in Nepal water from the Kosi river and from the Sun-Kosi river or within the Kosi basin from any other tributaries of the Kosi river as may be required from time to time. The Union shall have the right to regulate all the balance of supplies in the Kosi river at the barrage site thus available from time to time and to generate power in the Eastern Canal” pursuant to Clause 4 (i) of Koshi Agreement. It is clear that these people are – advertently or inadvertently – furthering Indian interest, but the Indian government does not seem to subscribe to the principle these very people swear by. Otherwise India wouldn’t have built the Farakka barrage to divert water from Ganga River to Kolkata, thus depriving Bangladesh of the water she is rightfully entitled to – thereby leaving the Dhaka port high and (literally!) dry. Even if one was to accept the logic of international water course, the augmented flow will not be the “same” water. What the proponents of this concept need to understand is that the augmented flow generated by storing it in a reservoir inundating Nepal’s land is the water with temporal value added by Nepal. Therefore, Nepal is entitled to the “value” that has been created/added by way of storage of such water in Nepali territory. The problem lies in their mindset that the water flows down to India anyways. The water that flows down during the normal course is the water which is devoid of any value addition. Such water even causes flood during rainy season. But by building a reservoir additional value has been created/added on the free flowing water. Therefore, Nepal is entitled to a “fee” for the value added as such. People advocating allowing such value added water to India free cost can in no way be deemed to be working for the interest of Nepal and its people. This thinking on their part is the other half of the oxymoron statement that the water normally flowing in the river is waste of “valuable” water. They don’t tire of attributing value (hence the relevance of wastage) to the normally flowing water which is bereft of any value addition (neither spatial, nor temporal) but are adamant to bestow value added water free of cost to India. Carbon offset does indeed occur by the export of hydropower from Nepal to India. It is also true that, due to submerged vegetation in the reservoir, methane is indeed generated by the reservoir. If the carbon offset by the former is more than carbon equivalent emitted by the latter, then there is considerable value in such carbon offset. A pragmatic approach on the part of Nepali hydrocracy would have been to ensure that Nepal isn’t shortchanged of the proceeds of carbon trading emanating from the export of hydropower from West Seti project. But this section of hydrocracy that profess their love for Nepal, wish that no question like this is raised such that Indian establishment becomes annoyed at the ineffectiveness of Nepali hydrocracy in protecting the Indian interest. West Seti project management opines that carbon offset hasn’t been traded for projects larger than 200 MW. There are two issues: One, there is no harm in trying for a larger project. Two, it is incumbent on the part of GoN to ensure that if any carbon offset from this project is traded in the future, Nepal’s rights are protected. Therefore, under the arrangement for West Seti project, Nepal gets shortchanged in many ways. She has to internalize various costs like inundation/submergence by the reservoir and in Banke district, displacement of people by the reservoir and in Banke district, restriction on consumptive (irrigation) use of water in upstream area, unavailability of water in de-watered area to irrigate. While providing good quality power to India at low cost on top of providing benefit from flood control, augmented flow and carbon trading. In this backdrop one wonders why Nepal is determined to go ahead with this project! The transfer of the power plant to Nepal after 30 years, free of cost has been used (even by the Supreme Court) to justify Nepal internalizing all the costs mentioned above to export peak-in energy at rock bottom price. However, India will keep flood control and augmented flow benefits permanently (even after handover of the plant in 30 years) as “existing prior consumptive use” principle will kick in while Nepal will lose 3004 ha under the reservoir and 1,630 ha permanently, 645 ha partially in Banke due to Laxmanpur “barrage” coupled with the augmented flow to India. In this backdrop it is hard to accept that even Supreme Court verdict has served national interest. What has been said by the project proponents (echoed with glee by Nepal’s hydrocracy) is that Nepal will receive a project worth $ 1.2 billion free of cost in 30 years. This has got a cross section of Nepali hydrocracy enthralled which has succeeded in spreading the contagion to the uninformed general public. It needs to be remembered that the Present value of $ 1.2 billion to be received in 30-year hence is just $ 68.77 million – not a huge amount worth to be excited about. Similarly, looking at it from another perspective, depreciated value of the asset worth $ 1.2 billion today in 30 years is just, again, $ 48 million (after depreciating the property for 24 years). As the old saying goes, it will be tantamount to people going about bragging about having put on some weight while it was merely a case of swelling of the body. Because, thirdly, by then, although the civil works part may be in a fairly good condition but same will not be true in the case of electro-mechanical equipment which needs to be replaced in 25-30 years. 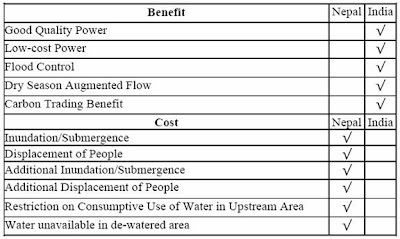 On the contrary Nepal stands to be shortchanged of $ 2.075 billion (at current price level) for the augmented flow of water over 25 years, even if Nepal is to get back the augmented flow too after the handover of the project. Similarly, Nepal also is not going to receive $ 555 million for the carbon offset during 25 years operation of the plant that she is entitled to. Moreover, it also needs to be remembered that this calculation does not take into account the power benefit that is due to Nepal. In this scenario, Nepal does not get what is rightfully due to it. But even after hand over of the project India will continue to keep benefit from flood control as well as from the augmented flow. She will end up having right to these permanently as she will use the principle of “existing prior consumptive use.” In Nepal’s case, the land inundated by the reservoir and Laxmanpur barrage will continue to remain unavailable to her permanently, till decommissioning of the plant. Besides, there is the issue of decommissioning which both the hydrocracy and the project people don’t like to talk. Although the main source of Kulekhani reservoir, for example, is not based on silt laden river, the dead storage of this reservoir is already 25%. In other words, the capacity of Kulekhani reservoir has diminished to 75% of original capacity in about 2 decades. Same (the role of silt) can also be seen from the rise of river-bed of Koshi River by 4 meter, by now, compared to the level of the land in the surrounding area. Seti too carries high silt load and West Seti project will transform into a run-of-the-river project from the reservoir project in about 30-40 years. At that time, after getting it handed over to Nepal, this project’s dam will have to be decommissioned. As the private sector has not provided any budget for this purpose, the government of Nepal will be forced to spend money for this purpose. Meaning, when Nepal is supposed to be “enjoying” electricity from this project handed over free of cost, she will be forced to shell out money for decommissioning which will cost more than the initial investment to build this project. The aggregate mark secured by this project is the lowly 16.55 out of a total of 308.5 which comes to just 5.36%. A project’s advisability from national perspective must be decided on the basis of its score on above basis. If a project deserves at least 150 marks out of 308.5 then that project enriches the economy a lot than a project like West Seti. Alternately, India should provide land in exchange of inundated/submerged land of over 4,000 ha pursuant to precedent set by Sarada Agreement of 1920, the 3rd clause of which reads: “That the Nepal Government would transfer necessary land for the construction and maintenance of canal works which is provisionally estimated at 4,000 acres and would receive land equal in area from the British Government.” because, the inundated/submerged land under the reservoir will never become available for economic/productive uses by Nepal. If above structure is unacceptable to the stakeholders, then the project should be structured as described in following lines. It should be built as a multipurpose project in order to irrigate land in Nepal and the dam height should be fixed according to irrigation need of cultivable land in Nepal. Therefore, the inundation/submergence of land in Nepal should be commensurate to the extent of Nepal’s irrigation requirement only. The electricity should be used to meet Nepal’s need of peak-in energy demand and export only excess energy to India, not power. Besides, as long term PPAs yield low tariff (and vice versa – depicted by the diagram below), no long term PPA should be executed. Only short term PPA should be signed with an eye on Nepal’s need each five-year blocks. The proponents of the project seem to be trying to obfuscate the important (with high value for Nepal) issues by citing indirect benefits to Nepal in terms of employment generation etc. occurring during construction period which automatically occur in the alternative models recommended above. Similarly, they have a litany of “anticipated spin off benefits” which too does take place in the recommended models above. Source: Environmental Assessment Report, prepared by West Seti Hydro Limited for ADB. As specified in “Table 3: Land Use on Sites to be Permanently Acquired” of Environmental Assessment Report prepared by West Seti Hydro Limited for ADB. First signed away in the name of MoU for Tanakpur power project, but after the intervention of Supreme Court, in the name of package deal, Nepal was betrayed by signing a treaty for the whole Mahakali River which was even ratified by the Parliament – an act of national betrayal. A transcript of the interview has been published in Nepali Times weekly, 19-25 Sept 2008, #418. Based on the precedent set by the agreement between Lesotho and South Africa. Decommissioning means either stopping production of electricity from the plant or the demolition of the civil and electric infrastructure in order to restore the river ecosystem, minimize or eliminate safety hazards and put the river and land resources back to economically productive uses, when the useful life of the project expires. This is the paper presented in the workshop organized by Jalshrot Vikash Sanstha on September 26, 2008 on "West Seti Project" where the only other paper was presented by SMEC, the proponents of West Seti project.